BY MIKE KOCHHEISER, Lubrication Specialties, Inc. The efficiency of fuel filters has come a long way over the past decade. In fact, most common rail engines being produced today include a factory fuel filter rated at a 2-5 micron efficiency, while just a few years ago were being produced with a 10-20 micron rating. Although the tighter tolerances of the fuel filter offer better wear protection to the engine, it provides a much greater risk of becoming plugged with gelled diesel fuel even sooner (at warmer temperatures) than before. The quality of today’s diesel fuel varies from one station to the next. Diesel fuel is a very complicated mixture of many different compounds. Some of these compounds are referred to as paraffins, which solidify once they reach their “freeze” point. The solid form of these hydrocarbons is a thick, waxy substance that is referred to as the “gelling” of diesel fuel. Every hydrocarbon has its own freeze point, making it difficult to know the exact quality of the fuel when it leaves the pump. Due to the variances of wax content from one batch of fuel to the next, there is not one exact temperature that the fuel begins to gel. 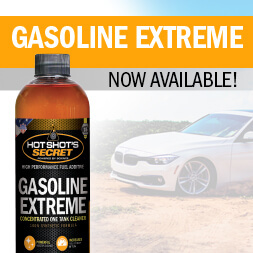 However, the threat of fuel gelling typically presents itself around 20 degrees Fahrenheit. When it comes to fighting fuel gelling, there are a few inexpensive options that will save you from headaches and even maintenance expenses. If you are lucky enough to have a heated garage, storing your vehicle in a temperature controlled environment is the easiest way to keep the fuel from reaching its freeze point. 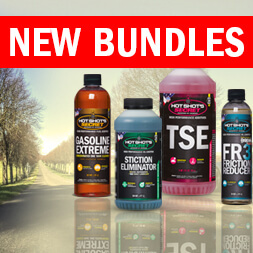 If heated storage isn’t an option, another way to consistently increase the quality of fuel and decrease the freeze point is to use a diesel fuel winterization additive like Hot Shot’s Secret DIESEL WINTER ANTIGEL. The DIESEL WINTER ANTI-GEL will lower the freeze point to approximately -40° and reduce fuel line freezing. A quality diesel anti-gel treatment will not only decrease the gel point, but it also contains a wax anti-settling agent to keep the wax dispersed, which keeps your engine running longer. With the common-rail engine beginning to become the normal for most diesel engine manufacturers, it is important for drivers to thoroughly understand the threats of fuel gelling, and how it can affect the performance of these engines during the winter months. It is worth making an extra effort to prevent this issue and protect the machines you rely on with diesel anti-gel treatment.